During my preparations for a presentation in October 2014 in the Hermitage Museum in Amsterdam for a talk in the accompanying program for the exhibition Dining with the Czars, I experimented with several Russian nineteen-century recipes. I have adapted one of those recipes, a soup, for this page. The recipe originates from A Gift to Young Housewives (Пода́рок молоды́м хозя́йкам) from Jelena Molochovjets. This was a very popular cookery book which was printed and reprinted in Russia dozens of times between 1861 and 1917, and was also translated into German. I have provided more information on this cookery book on the page with the recipe for Vinigret, the original Russian salad. On the left is a detail from ‘The farmer’s market in Moscow’ by the Russian painter Vladimir Makovski (1846-1920), from either 1875 or 1889. Everyone has heard about borscht, the soup with red beetroots. Many people think it is served cold and that it is of Russian origin, but there are actually many versions of beetroot soup. These are not only from Russia, but also for example from the Ukraine and Poland. Most of these soups are served hot as well, and not cold. The cuisine of Eastern-European countries abounds with rich, tasty soups and stews. This could be because of the way food was traditionally prepared in that region, in (rather than on) a stove. 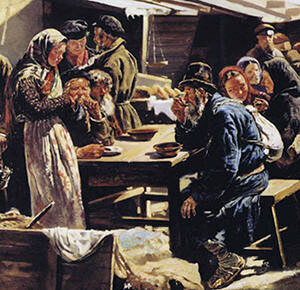 According to Toomre, who published the English translation of the Gift to Young Housewivesin 1897, the basic fare of Russian peasants consisted of shchi (cabbage soup) and kasha (buckwheat grits). 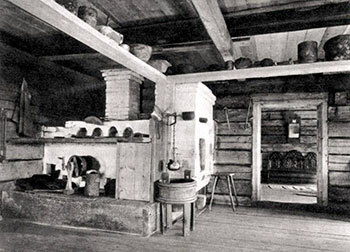 During the nineteenth century, many rural households in Russia and the Ukraine did not possess a hearth or a stove on which pots and pans were placed. Instead, there was a gigantic stove that could occupy a quarter of the living/cooking/sleeping room. This stove was heated once a day and used for multiple purposes. Bread was baked in it, soup kettles were placed in it, and it was used for washing and drying the laundry, letting dough rise and beer ferment. Finally, it was also a warm place to sit or sleep on. Stoves are an important element in folk tales as well, and during pogroms people could hide in them. An ailing person would benefit from a short stay in the stove. From this is it clear that not all spaces in the stove were searingly hot. Stoves like these are still in use today, and there exist modern versions of them that I love. The soup was placed in one of the spaces of the stove to simmer for hours, so it would be ready immediately when it became time to eat. 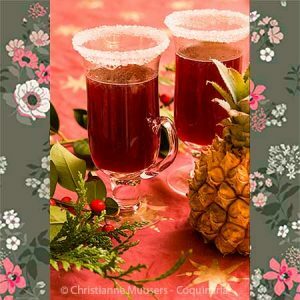 Another preparation that can be made in the stove is kvass. This is the well-known Russian drink made from fermented rye bread. The fermenting takes place in the stove. If you want to try it, you can buy kvass in Russian and Polish food stores (at least, in the Netherlands). The taste is not bad, and it actually reminds me of Cola. In the catalogue that accompanied the exhibition Dining with the Czars in Amsterdam, there is a description of what the various Romanov-czars liked to eat. 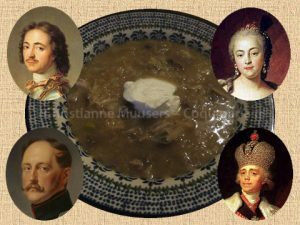 Among cabbage soup (shchi) loverswere Peter the Great, Elizabeth, Paul and Nicholas I (their portraits are on the photo of the dish below). Cabbages, beetroots, carrots and turnips were the standard vegetables of the Russian cuisine. These were also preserved so cooks were able to prepare them during the long, frozen winter months. White cabbage was preserved as sauerkraut, and the cabbage soup with sauerkraut is called sour shchi. When I announced my intention of preparing sauerkraut soup, I got little encouragement from my family. Many people do not like sauerkraut, let alone when it is served as a soup. Still, just try it! The soup is delicious and warming, and the sauerkraut has become soft and subtle in taste from the long hours in the stove. Now I am going to pretend that I uderstand Russian. Below is the Russian text from 1866 (see bibliography), on the right my translation, made with the help of google-translate. Below that is the English translation by Toomre of the edition from 1897 (see bibliography). That version is more clear and offers more serving suggestions than the version from thirty years earlier. Сварить бульон из 3 фунтов говядины или 2 фунтов говядины и 1 1/2 фунта ветчины с сушеными грибами и пряностями, процедить. 2 стакана кислой капусты поджарить до мягкости с 1 1/2 ложками масла, с 1 мелко изрубленной луковицей и толченым простым перцем, положить потом в бульон, варить; когда мясо и капуста будут совершенно готовы, подавать с уварившейся нарезанной ветчиной или мясом. Можно положить во щи 1 ложку муки и сметаны и вскипятить еще раз. Подаются к этим щам сосиски жареные или вареные, или жареная крутая гречневая каша 128. 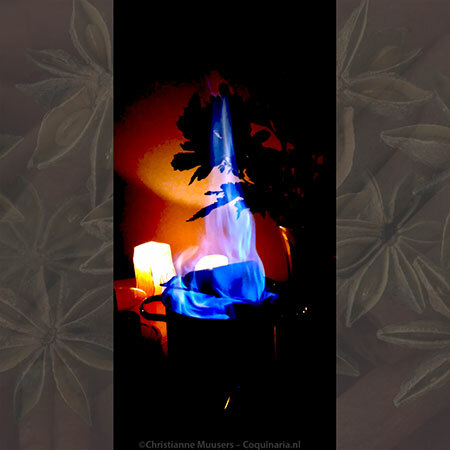 Make a stock from 3 pounds beef or 2 pounds beef and 1.5 pound ham, dried mushrooms and spices. Drain 2 glasses sauerkraut and fry until soft with 1.5 tablespoons oil, 1 chopped onion and finely pounded black pepper, then add to the stock. Cook until meat and cabbage are fully done. Serve with chopped boiled ham or meat. One can add 1 spoon flour and sour cream to the soup and bring it to the boil once more. Prepare a bouillon in the usual way from 3 lbs fatty beef, using chuck, rump, or brisket. Or, use 2 lbs beef and 1 lbs ham with dried mushrooms and spices. Strain the bouillon. Squeeze the excess liquid from 2 glasses of sauerkraut, chop, and fry butter or, better yet, rendered beef or pork fat. Pour in the bouillon, add 1 spoon flour mixed with water, and boil until tender. When the meat and cabbage are done, serve the soup with the boiled sliced ham or beef. Serve this shchi with one of the following: sour cream, fried or boiled sausages, fried thick buckwheat kasha, pancake loaf, or pancake pirozhki made with a stuffing from the mushrooms that were boiled in the shchi and buckwheat kasha. For the stock you can use Molochovjets’ recipe, but replace a third of the beef by cured ham, and use more dried mushrooms. Stevig voorgerecht voor 4 tot 6 personen of maaltijdsoep voor 2 tot 3 personen; voorbereiding 10 minuten; bereiding 75 minuten. Prepare the basic stock according to the recipe. Strain the stock, you do not need to clarify it. Keep the meat and the mushrooms, the vegetables can be discarded. Squeeze the sauerkraut and chop it roughly. Heat the butter, oil, lard or suet in a large skillet. Fry the onion with sauerkraut and allspice until the cabbage has softened. Sprinkle with a spoonful of flour, stir, then add the stock while you keep stirring. Leave the soup on a slow fire for 45 minutes. Then add the chopped meat, ham and mushrooms that you kept from making the stock. Simmer for another fifteen minutes. Serve the soup in preheated soup plates or bowls and top each portion with a dollop of sour cream. If it pleases you, you can provide fried or boiled sausages, fried kasha or mushroom piroshky (see recipes below). Russians may still consider this a first course, but to me it seems like a complete meal. Prepare a yeast dough or flaky dough. Cut 200 gram mushrooms into quarters, and heat them in a frying pan with some salt, pepper, parsley and dill. Do not add butter before the mushrooms have relinquished their excess liquid. It will take about 1 tablespoon of butter and 2 tablespoons sour cream. Keep stir-frying until the mushrooms are done, then let them cool. Roll out the dough and cut into squares. Put one spoonful of stuffing on each square, then close the dough like a book (an oblong square). Pinch the borders of the dough together, and glaze the dough with some stirred egg. Joyce Toomre, Classic Russian Cooking: Elena Molokhovets a Gift to Young Housewives . Bloomington, 1992 (uses the 20th edition from 1897). Elena Molokhovets, Пода́рок молоды́м хозя́йкам (Podarok molodhym khozyaikam, ‘A gift to young housewives’), St.-Petersburg, 2nd edition from 1866, unknown edition between 1866 and 1877 (3rd to 7th edition), and the 22nd edition from 1901. Helene von Molochowess (Jelena Molokhovjets), Geschenk für junge Hausfrauen, (‘A gift to young housewives’) Leipzig, 1877. Jelena Ivanovna Molochovets, Een gechenk voor de jonge huisvrouw. Het klassieke Russische kookboek. (‘A gift to young housewives’) (Anne Scheepmaker, Egbert Hartman, Sannah Edens), Amsterdam, 1995 (selection from the 9th edition from 1881). This is a nourishing winter soup. The idea of sauerkraut soup me seem strange, but the taste is excellent.